Ever heard "less is more"? 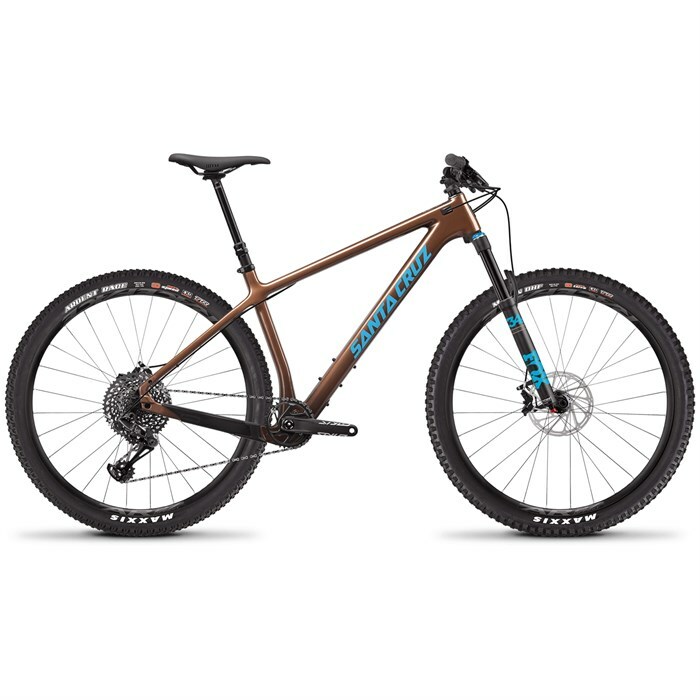 Well, when it comes to the Santa Cruz Bicycles Chameleon C S Complete Mountain Bike that would be an accurate statement in more ways than one. For the first time ever the "tin lizard" is offered in a carbon frame, taking mountain bike minimalism to a whole new level. Boasting a signature carbon C frame with Boost spacing, this light weight trail slayer has a super stable foundation for all sorts of bike adventures. Add in a SRAM Eagle drivetrain, 120mm of Fox front travel and water bottle/pack mounts and this steed just jumped to the top of the versatility list. Quit compensating with all that suspension and take it back to the basics with the Santa Cruz Bicycles Chameleon C S Complete Mountain Bike. Two Bottle Cage Mounts  Including option for a cargo cage mount under downtube. Fox 34 Float Performance  Performance forks retain the same black anodized 7000 series aluminum upper tubes as Performance Elite, but have a different damper (FIT GRIP) with fewer adjustments. A Performance Series graphics package is found on these forks to continue the black-on-black look. SRAM Guide T Brakeset  Guide T brings the consistent performance that you have come to expect from SRAM's lightweight Guide four-piston caliper. Pair this with MatchMaker™ for a clean looking bar set-up, plus the ease of use with SRAM's Bleeding Edge™ drip-free bleed port and you have a smart budget minded brake that keeps you in control. Race Face AR Offset 40 29" Rims Laced to DT 370 Hubs  A light and tough alloy wheel made for the demands of the EWS Enduro series, these are trail-tested to be durable and responsive. At 30mm internal width, they pair well with today's wider trail tires. Maxxis Ardent Race Rear Tire  The Ardent Race tire is ideally suited for technical XC race courses and endurance-length events. With its medium-height tread, the Ardent Race bridges the gap between the XC-oriented Ikon and the trail-oriented Ardent. The center knobs are ramped to reduce rolling resistance, and the side knobs are angled and stepped to provide great biting traction in corners. Choose the Ardent Race for your next demanding XC race or epic trail ride. Front Tire: Maxxis Minion DHF 3C EXO TR | 29 x 2.3"
Rear Tire: Maxxis Ardent Race EXO TR | 29 x 2.35"